I was heading to Orlando to attend a conference for work and I figured that this was the perfect time for my husband and baby boy to tag along, because they could enjoy the pool at the hotel during the day, and we can hang out for dinner in the evening. I am a professional Meeting & Event Manager, so I literally plan everything. This trip was no different. I went and bought a bunch of snacks, including gummy bears to help with the popping of his ears upon takeoff, packed his carry-on book bag and prepped his clothes for our early morning flight. At 4:30am the morning of our flight, we woke got dressed and headed out by 5:40am for our 8am flight. Making good time, about 15 minutes into our drive to the airport, I realized that we had forgot to leave a spare key for a friend who was going to be watching our dogs for us while we were gone. Shoot! We made a quick U-turn, dropped off the key and were back on our way. By this time, it was around 6:10am. Now I felt like we were rushing, but I knew we would still make it on time. I turn to my husband and say “I really can’t believe all of this is happening. I just wanna get to the airport.” So we head back home and give ourselves about about 20 min to quickly clean my baby, clean his car seat, because mind you…we had to take it with us to Florida because we were going to have a rental. So we clean the seat as much as possible, change baby boy’s clothes, clean the backseat, and hop back in the car and head to the airport. The car seat still had a vomitty smell, but we just covered it with a towel and planned to take care of it in Orlando. By this time, it was about 6:45am, and I live approx. 30 minutes from the airport. My husband drove and we arrived to the airport around 7:10am. We still had to park, and of course there were no parking spots in site! We circled a few times and eventually found a spot. We hop out, grab everything and run to the terminal to check-in. We get to check in and the and the lady at the Southwest gates checks us in and says we just made it. Whew!! Great. We run to to security where there is a stroller line, it was going super slow. We finally get to the front and the man in front of us has a problem with his ID and has to pull his other one which seemed like forever–I am sure it was because every second counted at this time. But get through it. If you live in Atlanta, then you know that there is a train to get to your gate and this alone takes several minutes. We make it to the train and to our gate….and guess what…we missed the boarding by 7 minutes! 7 MINUTES! I could have fallen out. But the nice people at Southwest inform us that they would gladly place us on another flight at no charge. Great!! Not really. several flights go by and we couldnt get on any of them. Every flight to Orlando, or Florida for that matter was overbooked to the point that they were asking ticket holders to get off for an airline voucher and a ticket for tomorrow. Lets fast forward past the HOURS (approx 9 hours) of waiting in the airport…past how COLD it was in the airport…past the fact that my baby had grown restless and wouldn’t sit still for all the snacks in the world…past the fact that I HAD to make it to my conference that had been paid for by my EMPLOYER…past the fact that I HAD to figure out a way to get to Orlando that day and as much as I am solution driven…I had no solution for this problem. Okay, so as we were sitting in the gate trying to figure out a solution, I was on the phone with my mom and she suggests renting a car and dropping it off in Orlando to pick up the car that my job had rented for me in Orlando. Okay, that could work. I mean it is only a 6 hour drive and by this time it was 4’oclock yall! 4pm! We had been there since around 7am, and at this point we were just ready to go. We head to the rental counter.. and every company said the same thing..to pick up and drop off a car in a different location would be around $250. That was absurd to me, especially because I was onlu going to need the car for around 6 hours. About 6 hours later, we are in Orlando. Oh wait, we gotta go to the airport and pick up our bags that we checked and that had made it to Orlando safely by plane:) We had to get to the airport before midnight or we would not be able to get the bags until tomorrow morning. No, I wanted my stuff now. We get to the bags around 11:40pm and head to our hotel…finally! We ended up enjoying our trip even though it started off rough. 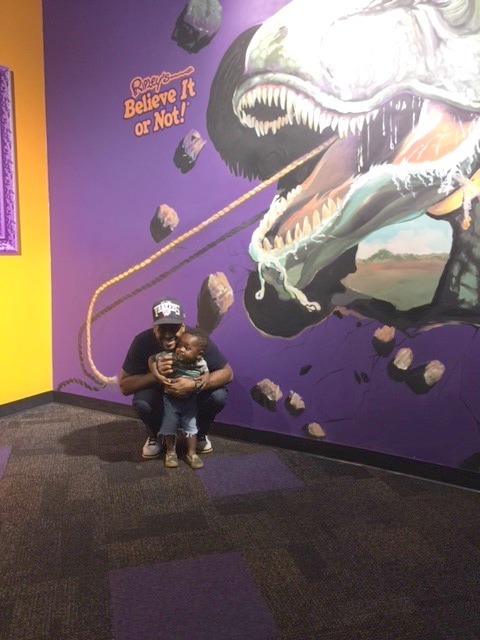 We got to go to Ripley’s Believe it or Not Museum, eat at Tommy Bahamas at Pointe Orlando and just have fun. I also enjoyed my conference and we could see Disney World from our hotel, It rained the day my husband was gonna take the baby to the pool, but its okay. They still got out to explore the property of the hotel while I was in my conference sessions. Plus, my baby never threw up again, so it was weird as to why he vomited anyway. 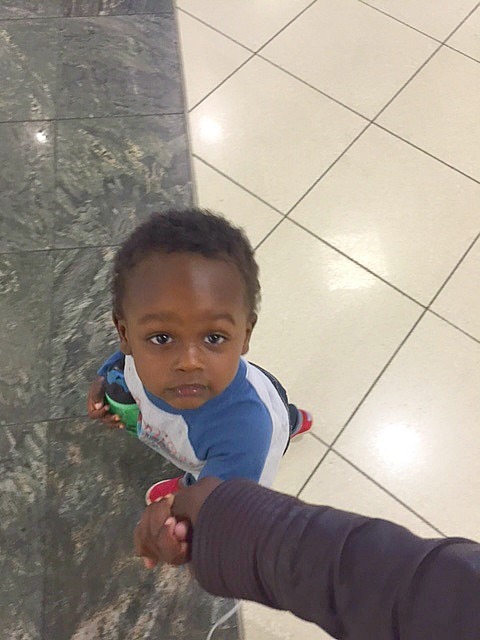 Oh well, I guess everything happens for a reason, but I thought it would be fun to walk you through the day that my baby almost had his first flight. We are traveling again in December, so we will try this “first flight” thing all over again! Thanks so much for stopping by and sticking through this long post! Until next time. Oh my! We have had that experience before as well. So not fun, and super stressful!! I had to change both of our girls on the sidewalk outside the airport when we arrived, deal with carseats, and two American girls dolls who now had vomit all over them as well. UGH…GROSS!! I'm glad you decided to share! In the end you made it safely and baby Jules was feeling much better, but my goodness what a rough start to your day!!! Sounds like a script from a holiday movie. WOW!!! That is just how life happens, your poor heart was up, down and all around. I'm glad baby was ok and you arrived safe. And Brandi is right, it does sound right out of a movie.